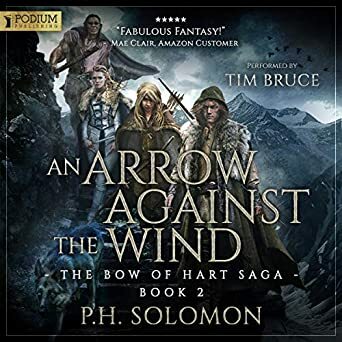 It’s audio release day for An Arrow Against the Wind and I thought I would re-live the beginnings of the book with some development history involving the series. The Bow of Hart Saga began decades ago as an effort entitled, An Arrow Into the Wind, which was completed back in the early 1990’s – yes a long time ago. That original effort contained elements of mostly what would become The Bow of Destiny as well as part of An Arrow Against the Wind. After I completed that initial project, I did what all would-be authors do and submitted it to many publishers. I scoured available resources at the time and made lists, then sent the paper manuscript out for what seemed like countless times. Eventually, the trail of rejections ended with a contract offer from a small press. A lawyer in the family went over that contract and left a lot of red marks throughout that non-negotiable document. I eventually backed away, feeling that the contract was not for me. Over the next decade plus, I made attempts to re-boot the series, always with the feeling I had made a bad decision about the small press contract. I guilt-tripped myself into feeling that publication somewhere was better than nowhere. The series languished in storage and the back of my mind until I felt a strong urge to go back to writing once again, just after all the online self-publishing boom began. I started several new projects but decided that my former book needed to be addressed, my reasoning being that it had garnered a contract offer and it needed a shot. Cutting my teeth on the book/series seemed like the best option. I immediately realized that the entire book needed re-writing and my first painful decision was to split it into two books which led to the first title being The Bow of Destiny. Re-writing meant updating the entire style, plot, characters, voice and, eventually, technique. The writing was too distant so it needed an injection of deep point-of-view. Re-writing The Bow of Destiny took years of work and learning more than I ever knew previously but I finally published it in late 2015. The Bow of Hart Prequel Pack released as a free audiobook in September 2018 and contains both free series prequels, Trading Knives and What Is Needed. The Bow of Destiny languished in the self-published ghetto of forgotten books for months to my discouragement but not to my surprise. During that time, instead of working on the next book, I worked on several projects with my employer and helping my daughter get into college. Once those projects ended in the spring of 2016, I drifted back to writing, this time determined to market The Bow of Destiny. By the Christmas season of 2016, the book was selling extremely well, eventually landing in the top 20 of all of epic fantasy on Amazon – right up there with the big-name authors. That was both exciting and unnerving. I couldn’t believe what happened. That sales burst led to several contract offers, one of which was for audio. Life and the holidays were so busy, I ignored the message in my inbox with the thought it was from some vanity publisher which I’d have to pay tons of money for audio publication. I planned to get to it later but never did for months. In early 2017, I started working more on An Arrow Against the Wind while I talked with an agent about contract offers. Then a layoff hit where I worked and sent me into unemployment for the next eleven months. While I looked for a new job, I worked on writing. An Arrow Against the Wind proved difficult since it required me to stitch together old content (it had been split from the original work) with new content. The process was nerve-wracking since I was out of work and felt pressured to get something new published. I rushed and, with the help of my editor, got the book released at the tail-end of April. The book sold very well and got even higher ratings than the first book. The Bow of Destiny released in September 2018 on Audible with the incredible voice-acting of Tim Bruce. Several months later, a conversation led me back to that email swimming around in my inbox. It turned out I had the audio contract offer for about nine months! I contacted Podium and we started a dialogue about publication and I was surprised to learn the company basically discovered The Martian. After months of discussion, I was pleased to sign with Podium Publishing back in March of this year after which production efforts started. The first results were The Bow of Hart Prequel Pack on AudFans, then The Bow of Hart on Audible last month. Today, that process continues with the release of An Arrow Against the Wind on Audible. The narration is fantastic as is the cover. This is an exciting season for me with the audio releases and will continue into next month with the release of The White Arrow on 11/27/18. But today is all about the second book, the one with the title so similar to the original title. An Arrow Against the Wind bridges the initial work of the series with the newest content but it’s far from a patch-job, having been named as the 2017 Book of the Year by Fantasia Reviews (following in the footsteps of The Bow of Destiny in 2016 by the same review site). This unique epic fantasy will keep you turning pages as Athson and company are drawn deeper into the intrigues surrounding the Bow of Hart. Pick up the second book of The Bow of Hart Saga because the adventure spins like an arrow in flight. 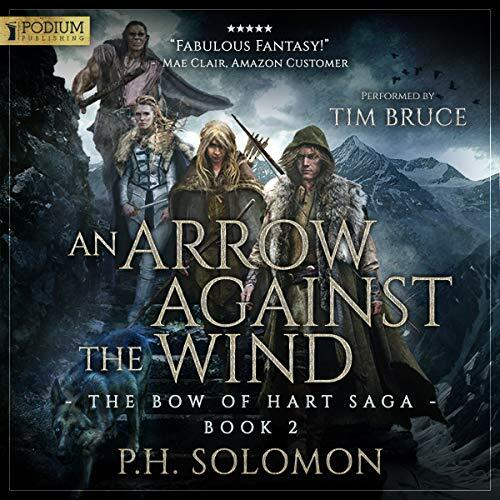 Hello to all the Archer’s Aim fans, P. H. Solomon here today in the continuing series regarding the release of The Bow of Hart Saga: The Bow of Destiny audio-book. I thought I would discuss some elements of working with a traditional audio publisher like Podium Publishing since it’s different than working with ACX or other audio self-publishing services. A few years ago, I investigated self-publishing an audio-book and soon discovered it was a completely different product altogether as opposed to a book in print. It’s far more expensive to create an audio-book because you have to hire a narrator and pay for studio time. It is possible to do all that on your own and purchase some equipment, but you run the risk of having a product that’s not good enough since it requires more specialization both with the narration and in audio quality. With a low budget mostly focused on e-book content production including editing and cover artwork, I gave up on the idea unless an opportunity presented itself. As I’ve shared previously, the opportunity did present itself and I almost missed it, thinking Podium was a vanity publisher. After a conversation with another author about audio, I was reminded of the email I had received and re-checked it. To my utter surprise, it was a real contract offer from the publisher to fully create the audio project, publish it and then market it. From there it was a matter of working through the details over several months while I completed The White Arrow. First of all, I have to say that audio narrators are now my heroes. After I started dictating this past year to complete several rough drafts at a faster pace, I soon realized that narrators are worth every penny they are paid. The reason I realized this is because when I transcribed my rough drafts into Scrivener, I could see all of my mistakes from my inexperienced efforts. Dictation and narration are quite a lot different, but they are similar enough that I realized a professional narrator is a big plus when it comes to audio. For that reason, I was thrilled when Podium Publishing contacted me after I signed the contract with them and they told me who the narrator would be. When I heard samples of Tim Bruce, I knew the narration would be top-notch and the end result did not disappoint me. Tim’s ability was evident from the first few words and I knew he fit my fantasy series well. But even later on as production moved from initial file-sharing stages, Podium contacted me numerous times for additional information to help in pre-production. I provided them with pronunciation recordings and lists of names which were all custom to the The Bow of Hart Saga. These were important for Tim Bruce so he had exact information to help him do his job precisely and professionally. The more I provided, the more he knew how to perform the story with a variety of accents. Podium presented me a choice to provide as little or as much information as I wanted for the audio production. But, since they were asking me all these questions I felt like my input as the author was very important and so I chose to be part of that pre-production process as much as possible. Obviously, given today’s digital world, the actual production can be done remotely and shared around between all of the various people involved at Podium. This information dump was just the start of working with an audio-book publisher. In addition to pronunciation, the narrator needed even more information regarding some of the background details of the world of Denaria in which the The Bow of Hart Saga is set. Tim was already reading much of the work and wanted more information about accents he wanted to include. My interaction was optional but I figured the more information I provided, the better the end result would be. I very eagerly replied to all email queries about details and accents. Tim arrived at several suggestions for character accent from various locations in Denaria. This was a rather surprising development, but once again, I was more convinced than ever that being under contract with audio-book publisher was the best situation for my books. As pre-production continued, there were a lot of exchanges of emails between myself and the Podium Publishing representatives. There were additional questions about back-stories for the characters to which I provided a number of different character sketches. Additionally, I had a good number of blog posts available about characters and other details of the world of the Denaria which I sent Podium. The publisher welcomed the wealth of information and input to better understand The Bow of Hart Saga. There were other details which also required my attention. Normally, a print publisher would probably create their own cover-art, but Podium often works with sefl-published science fiction and fantasy authors, so they merely requested original files. We were able to work with my artist to obtain the necessary files and Podium converted the fantastic originals to suit their needs. Everyone who sees these covers are very impressed. I discussed more of how the process worked last week on Story Empire if you are interested in reading more about that topic. Once production started, my input was not needed as much, so it just became more of a wait and find out what happens proposition. In the end, when I received samples of the work, I was blown away by results. It’s almost unbelievable how far this has all gotten for a first time author like me and one who had no audience three years ago. The books have already sold very well, in the thousands, and I’m looking forward to what comes with these audio-book editions. Working with Podium Publishing has been fun and exciting as I have learned more of how an audio-book is produced. I hope in the future that I will have a similar opportunity and, if so, I will certainly know what to expect from additional audio-books. Thanks for reading today, I hope you will enjoy my work and I appreciate all the support from the fans of the The Bow of Hart Saga. If you like this fantasy series, please consider sharing about it on social media, following me especially on my Amazon Author Page, BookBub and Goodreads. If you really want to know more about my writing venture, let me know and I’ll add you to my private group on Goodreads where I will be posting exclusive material and news I can’t readily share in public. Speaking of news, An Arrow Against the Wind is due out on 10/22/2018 and I hope to have pre-order links for the audio-book very soon. 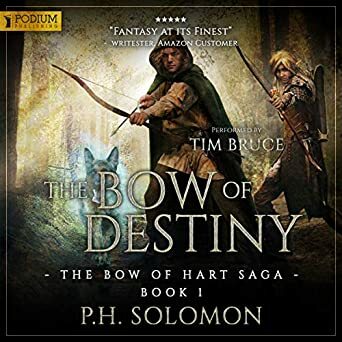 In the meantime, you can listen to the incredible performance by Tim Bruce on AudFans where The Bow of Hart Saga: Prequel Pack is free or going to the Audible page for The Bow of Destiny. If you already have The Bow of Destiny in e-book you can view the Amazon page and purchase audio for Whispersync on your Kindle for a fraction of the cost. If you are interested in the book, the e-book is on sale for 99 cents which makes the Whispersync purchase a great deal (Podium really handled this very well).